Choose a Stretch Fabric Display Stand for use as a back wall or divider for your client’s next exhibition space. 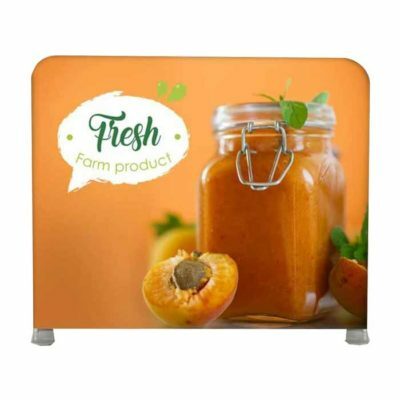 With full colour double sided printing, these stands provide an eye catching and vibrant addition to exhibition spaces. This stand is easy to assemble as the fabric slides over the top of the frame and zips along the bottom for a seamless display, free from creasing. The fabric is held straight and contains a large print area to display your client’s company information and imagery. For easy transportation, our stands are supplied with a padded carry bag complete with internal pockets to store the graphic and feet.